Recombinant fragment within Mouse Caspase-11 aa 50-300. The exact sequence is proprietary. WB: Untreated and treated with Lipopolysaccharide 10µg/ml for 8 hours RAW 264.7 whole cell lysate; YAC-1 and bEnd.3 whole cell lysates. IP: RAW 264.7 treated with Lipopolysaccharide 10µg/ml for 8 hours whole cell lysate. Our Abpromise guarantee covers the use of ab180673 in the following tested applications. WB 1/1000. Detects a band of approximately 43, 35, 30 kDa (predicted molecular weight: 43 kDa). Involved in ER-stress induced apoptosis. Cleaves caspase-1 (By similarity). Involved in the activation cascade of caspases responsible for apoptosis execution. Promotes IL-1 beta processing by ICE, so may also have a role in inflammatory responses. Mostly expressed in lung and spleen; weaker in heart and lung; little in liver, skeletal muscle, kidney and testis. Not found in the brain. Observed band size: 25,35,43 kDa why is the actual band size different from the predicted? Exposure time: Lane 1: 15 seconds; Lane 2: 3 minutes. Caspase-11 was immunoprecipitated from 1mg of RAW 264.7 (Mouse macrophage cell line transformed with Abelson murine leukemia virus) treated with Lipopolysaccharide 10μg/ml for 8 hours whole cell lysate with ab180673 at 1/50 dilution. 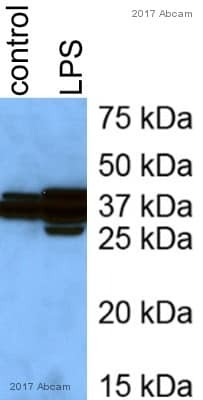 Western blot was performed from the immunoprecipitate using ab180673 at 1/1000 dilution. VeriBlot for IP secondary antibody (HRP) (ab131366), was used as secondary antibody at 1/10000 dilution. Lane 1: RAW 264.7 treated with Lipopolysaccharide 10μg/ml for 8 hours whole cell lysate, 10µg (Input). Lane 2: ab180673 IP in RAW 264.7 treated with Lipopolysaccharide 10μg/ml for 8 hours whole cell lysate. Lane 3: Rabbit IgG,monoclonal [EPR25A] - Isotype Control (ab172730) instead of ab180673 in RAW 264.7 treated with Lipopolysaccharide 10μg/ml for 8 hours whole cell lysate. Publishing research using ab180673? Please let us know so that we can cite the reference in this datasheet.